9 1/2" x 9" x 3"
8" x 7 1/2" x 2"
10" x 9 1/2" x 3 1/2"
We have an incredible variety of take-out containers on our site. But which containers should you choose for your establishment? In this video, I’ll go over some of the features you should look for and some of the considerations that should factor into your choice of take-out containers. Probably the most important and obvious consideration is what kind of food you serve. Of course, the size of your food is going to be important. Using the smallest container that works is your best bet to save money. It’s a good idea to have multiple sizes on hand for that reason. As far as style, a sandwich shop might do well with an inexpensive and insulating foam container, but a fine dining restaurant will want to choose a container that presents there food in the best possible light and allows the customer to warm the food properly. Some foods, like salads, look great in clear containers. If you are serving food that you want to keep crisper, make sure you choose a container with vents, to release condensation. If you serve liquid foods, a good seal is more important. 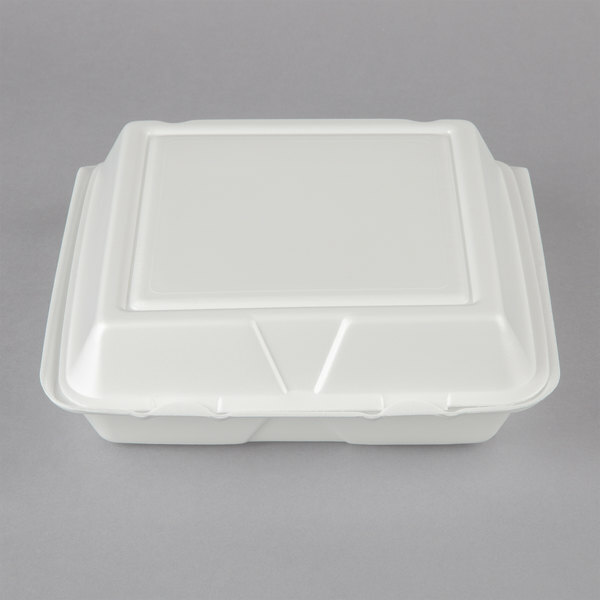 All containers insulate food to an extent, but nothing beats Styrofoam for insulation. However, anything other than mild re-heating will melt Styrofoam in the microwave. 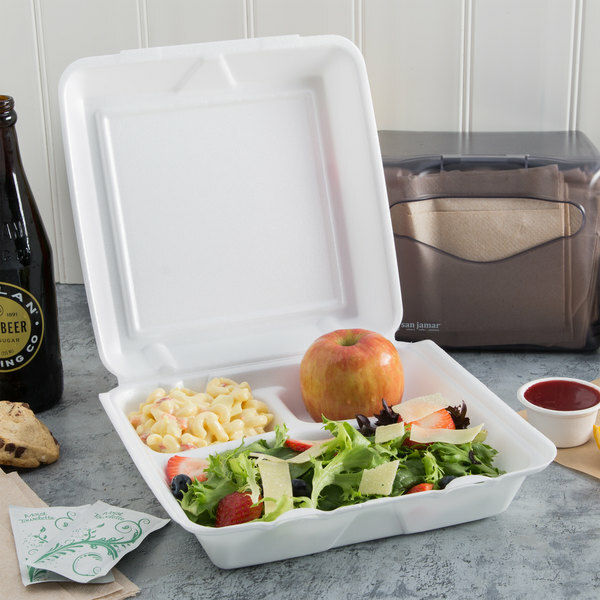 If you want your customers to be able to microwave the food, we have many choices, including some environmentally-friendly options and we also have microwaveable plastics that your customers will love, because they can be reused several times. We also sell that pizza shop favorite, foil take-out containers, which are great for putting your ziti or other foods in an oven. Cost is often the overriding factor, but don’t let it be the only one. 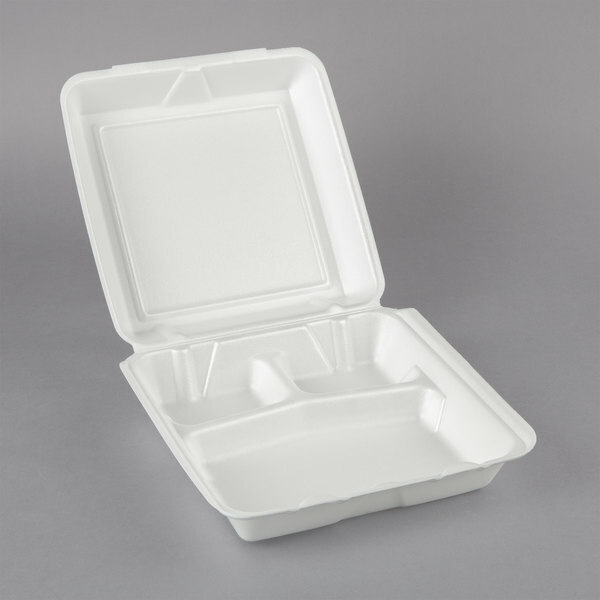 Nothing is less expensive than Styrofoam, but keep in mind that you shouldn’t use it if your customers are looking to your restaurant for a fine dining on environmentally-friendly dining experience. Whatever your choice, make sure you are using the smallest container that works. Are your snack bar customers taking the meal 10 feet to a picnic table? Foam is probably your most cost-effective option. Are you trying to promote curbside pick-up at your casual restaurant? Then consider sturdy, vented, microwavable clamshell containers to really help you promote the service be getting your food home in almost dine-in condition. If you are doing grab and go, you’ll definitely want containers that offer high visibility. And of course, the old doggie bag application will vary depending on the style of restaurant you run. Finally, there are environmental factors. 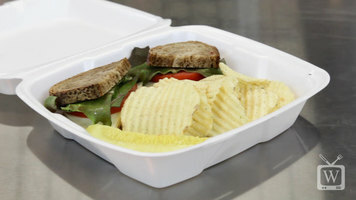 Some of you will have customers that are very sensitive to environmental issues, you’ll want to cater to them by choosing some of our compostable or degradable containers. Thank you for watching. Should you have any questions, please contact us! 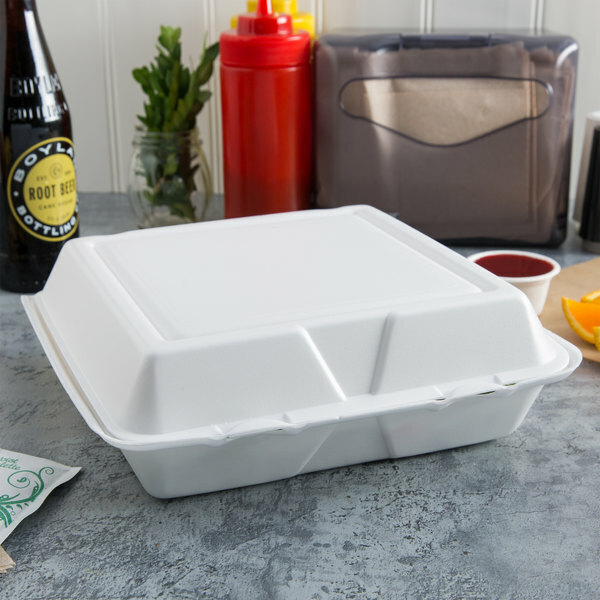 Check out this video to learn about all the different types of take-out containers that the WebstaurantStore has to offer! Present an entire meal in the same take out container with this Dart 95HT3R white foam Three-Compartment container with hinged lid. This partitioned clamshell container enables you to package an entire meal without the threat of cross-contact or intermixing foods. Divided into three sections, one large compartment encompasses half of this container and the remaining half is divided into two smaller compartments. The large compartment is ideal for entrees such as sandwiches, burgers, or chicken fingers. Meanwhile, the smaller sections can be used for two separate sides. Featuring a hinged lid, this container can be quickly and easily closed to keep up with the fast-paced environment of your restaurant or take out venue. With two secure closure tabs, this tightly sealed container is protected against accidental openings and spills during transport, giving your guests peace of mind knowing their meal is tightly contained. Plus, the insulated foam construction ensures your patrons' food remains hot or chilled until they are ready to eat, plus the foam material makes it a more cost-efficient option over other materials. Love these trays. Great to put subs salads wings pretty much anything that’ll fit. Love the separate compartments. Keeps items separated. Steardy good quality and great price. The Dart White Foam 3 Compartment Foam Hinged Lid Container has a nice construct. Durable, solid, and easy to use. We use this for every event we cater. A lot of folks like left overs, and we make sure they have an option for that. Cost effective carry out container. This is the standard take-away container used for years around the world. Cheaper than the "earth Friendly" choice. Works great. Exactly what we needed for dinners! They are sturdy and ample size! We use them for carry out. Large enough for hefty food helpings (lasagna, etc). The top stays on securely, it's light weight but quite sturdy . Will buy again! These compartments worked well for our sandwiches, chips and cookies. They were large enough to hold all of our items and condiment packs as well. We placed labels on the top and that gave our product an extra nice touch. The hinged lid closed nicely and stayed close. These containers are definitely of a higher quality than what one might purchase from another retailer. I absolutely love these! They're large enough to fit my customers full orders in. They also keep the food hot or cold (depending on the orders) long enough to make it to their delivery destination, and for the customer to get to enjoy a fresh meal. They're also very sturdy, which I also depend on with each of my orders being delivered. These have been my go-to for my business since I found them! I will never get tired of saying that only the Webstaurantstore gives you more for the buck! This is the first product that I actually tried myself before using them for my customers. I was curious and by no means disappointed. They kept my deep fried food hot for a reasonably length of time and kept it reasonably crisp. Nice! These are huge, I purchased these for a wedding we did. They have the divided three compartments and did the job they were made for. However, I gave it only 4 stars because they were somewhat flimsy, don't overload with too much food, this would be perfect for lighter fare, salads even. Great quality, great price (at a HUGE cost savings from our regular supplier), immediate shipment and as always receive right away. Thank you so much! These are pretty good. I like the price on them but I think I'm going to stick with the ones I got before for all my togo items. This are great for our orders. They are a great size and sturdy. The customers don't complain about the containers. I would buy them again in the future. these are perfect for take out in my drive-in. can add burgers, fries and beans to one container and cold salads in a dart solo cup with lid, makes the hot foods and cold foods separate. I will be buying many many more. Great for sorting foods. Keeps foods from mixing. Great for BBQ, carry out, potlucks or get together s. These hold a lot of weight. Lid closes snugly to keep in heat and keep out insects. Our BBQ customers loves them! Webstuarant is great! I was able to find anything and everything I needed for my new restaurant. The to go three compartment boxes was exactly what I ordered. We love theses Togo containers for our boxed lunches, they are very durable and the look of them are good and the price is even better. This container is exactly what I\'ve been looking for. The durability and design accommodate the items I need it for. I highly recommend it and will purchase it again. I'm glad you guys sell this dart brand white 9.5 x 9" x 3" styrofoam box. I used it for my annual Christmas party dinner. It's durability is pretty good considering the price you pa for it. I've used these for both hot and cold meals. For our spagetti dinner/fund raiser at church, there was ample space for a large portion of noodles, sauce, and garlic bread. Great for takeout and easy to close.